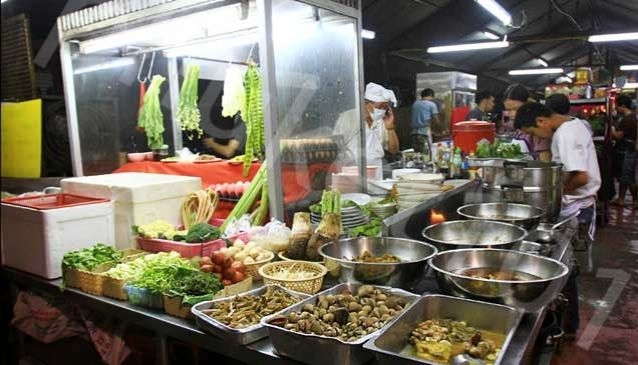 Although a basic restaurant, Ang Seafood in Sapan Hin in Phuket city is packed every night. There's nothing fancy about the establishment - there's a roof and plastic tables and chairs. Parking is hard to find but the seafood is well worth the hassle. Favourites are the Nam Prik Goong Sieb and the Tom Yam's also really tasty. Not to miss is Haw Mok Pla, a delicious spicy curried fish mousse steamed in bai cha-ploo leaves and wrapped in a banana leaf. Also definitely worth a go is the Tom Yam; Hoi Chak Tin, a local shell; Razor clams; and for the adventurous, ant's eggs.